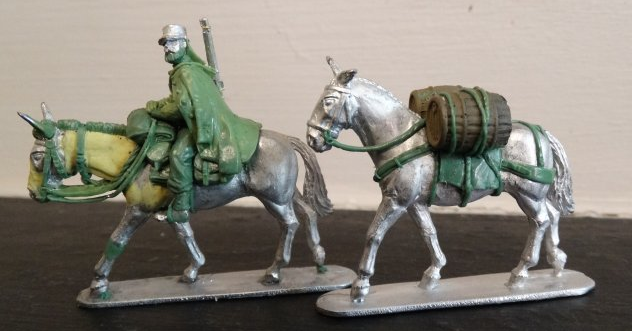 The next figures for release are almost complete and depict mounted Legionnaires on their mules,the final pack will contain two mounted Legionnaires along with two legionnaires on foot. Mounted Legionnaires (la Montee) were the elite units, with men volunteering, one mule (brele) being assigned to every two men, with them changing every hour. They could maintain a pace of about 4mph and cover 50 miles (80Km) in a day. There will be two variants of the mounted figure along with two variatns of the Legionaires on foot. We will also be producing a number of different pack mules, the example here has water casks. They should be avialable from Mike @ BlackHat from mid November 2014.